Happy Thursday, Trailer Heads and Teasernatics. It’s time for Trailer Happy Hour, the big cardboard box where we lovingly place all of the day’s hottest new clips and videos so they can be safely transported to you, the consumer, for your trailer reaction videos. Then we all watch those videos to see how we should feel about these trailers. Today we’ve got Slaughterhouse Rulez, Michael Moore’s Fahrenheit 11/9, Liev Schreiber’s Inside The Manson Cult, a new restoration of John Carpenter’s The Fog, a 47 Meters Down sequel, and Disney’s bonkers Nutcracker movie. Let’s do it! Slaughterhouse Rulez isn’t canonically related to Shaun Of The Dead, but it does feature Simon Pegg, Nick Frost, wacky jokes, and scary stuff. This trailer is very energetic and seems like a slight imitation of Edgar Wright’s typical style, though, so maybe it’ll be spiritually related. 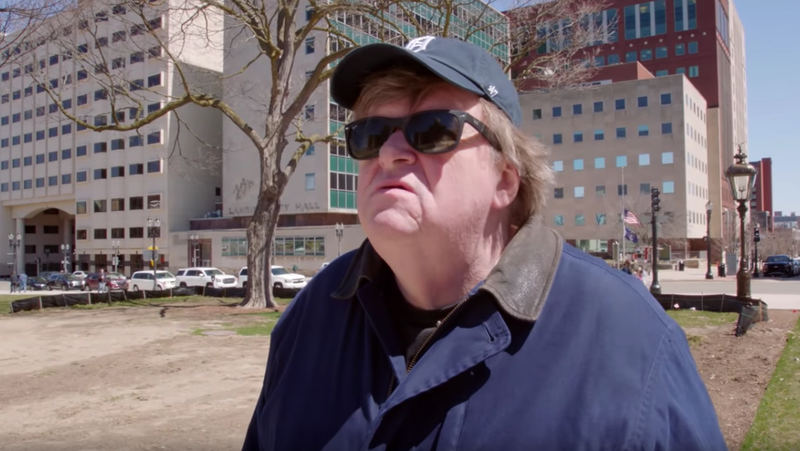 Michael Moore is back, and he made a documentary about Trump, the Flint water crisis, and all of the other bad things happening in the United States today. Let’s be honest: You already have an opinion on this, whether you’ve seen the trailer or not. The movie will be out on September 21. Did Charles Manson enter the public domain? Is that why everybody’s making Charles Manson stuff? This Charles Manson thing is a special that will air on Fox and it will be narrated by Liev Schreiber. Apparently there will be lost tapes? We’ll figure out what that means on September 17. John Carpenter’s The Fog, in glorious 4K resolution. Look at those blacker blacks and foggier fogs! This new restoration will be screened in theaters in October. Here’s a trailer for a sequel to shark movie 47 Meters Down. It is not called 48 Meters Down, possibly because they got to 47 meters and realized it just wasn’t scary enough to go down another meter. Instead, this is just “the next chapter” in the 47 Meters Down saga. Finally, here’s Disney’s The Nutcracker And The Four Realms, a movie that takes The Nutcracker and says “what if this was like Game Of Thrones and those Alice In Wonderland movies?” It looks very melodramatic and big and zany, and the clockwork soldiers are very creepy. It’ll be in theaters on November 2.